Save Our World Water Bottles on Sale! Comments Off on Save Our World Water Bottles on Sale! 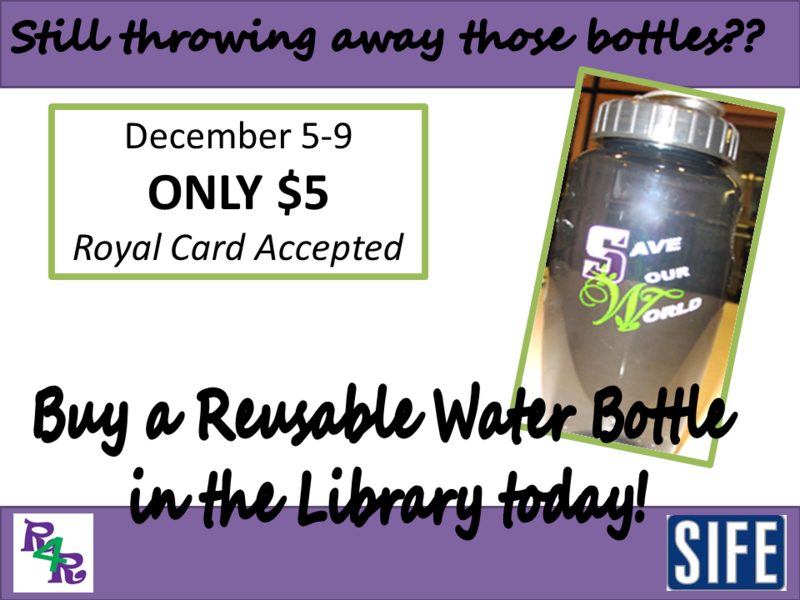 In collaboration with SIFE (Students In Free Enterprise), the library will be selling the “Save Our World” water bottles for $5 all week (Monday December 5th through Friday December 9th). 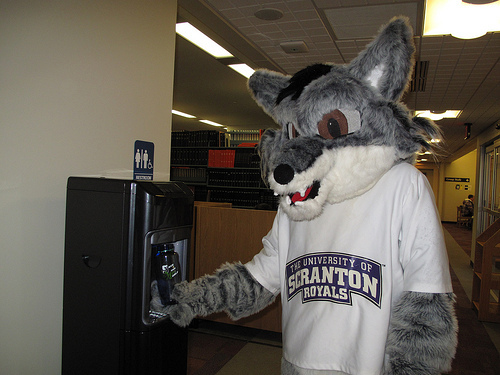 Stop by the Circulation Desk and pick-up the cheapest, most environmentally friendly bottle on campus! You can even pay with your Royal Card! 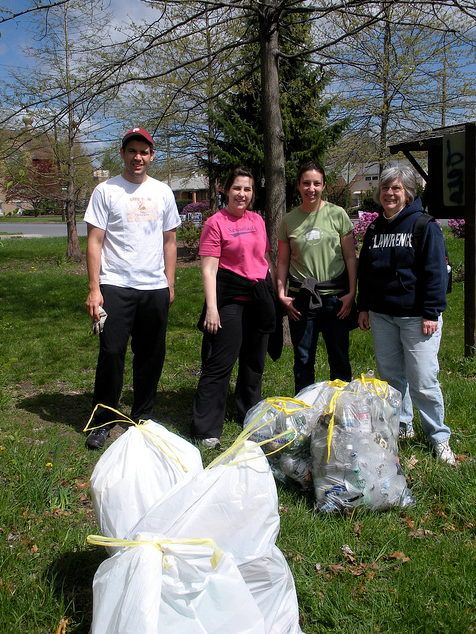 The Weinberg’s Green Team participated in a trail clean-up Saturday morning along their adopted section of the LHVA Heritage Trail. The team worked for two hours and made it through half the trail. In that short amount of time, they succeeded in filling 9 bags of garbage, several bags of recycling, a pile of metal, and a tire! Their adopted section is the CNJ portion and runs from 7th Avenue, along the South Side Sports Complex, to Elm St. The team will be planning more clean-ups in the future. Visit our Flickr page for more pictures from Saturday! 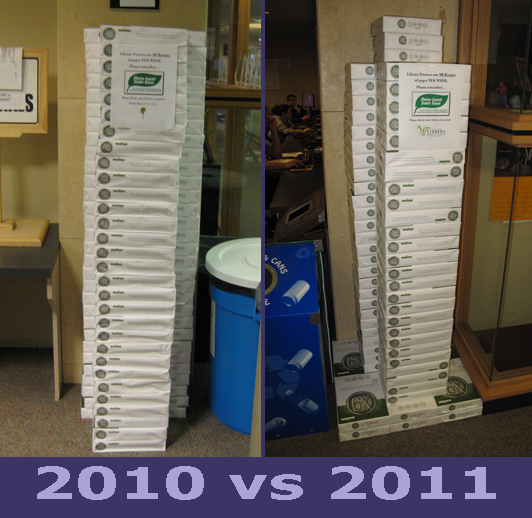 Even though I’m happy to report our structural engineering skills have improved from 2010; unfortunately, our sustainable use of paper did not. However, the increase paper usage is likely because all computer labs on campus have eliminated student printing. Considering almost all students (excluding personal printers) were sent to the library to do their printing, its probably safe to say our “paper awareness” and educational outreach efforts throughout the year had probably payed off. For Earth Week 2012 we fully expect the paper tower to be a fraction of the size of it’s ancestors thanks to a combination of duplex printing and outreach by the Green Team. The “wasted paper” display is a tough comparison for a number of reasons. In 2010, we didn’t have the clearly labeled WedgeCycle recycling bins throughout the building and by and large most people weren’t sorting their recyclables. So, paper that otherwise might have ended up in a trash last year is now being properly placed in a paper recycling bin this year. Also, this year we did 10 days worth of recycling whereas last year we did 7 days. Speaking qualitatively, it would seem that this years “wasted paper” display was an improvement over last years. It was approximately the same amount of paper, but there was no trash mixed in with the paper. Curbing the amount of wasted paper, unnecessarily duplicated prints, and print jobs left at the printers is definitely a priority for the Green Team. New for 2011, we had a Craft Night where students, staff, and faculty had a chance to come to the library to make Origami figures out of reused book covers. Pictured above is a display of some of our masterpieces. This year we hosted our first ever Environmental Art Show as an alternative way to educate about sustainable issues and to reach out to the community. Considering this was our first time hosting an Art Show, we think it turned out pretty good. We are looking forward to see what Environmentally themed art our Students, Staff, and Faculty will have prepared for next years Environmental Art Show! 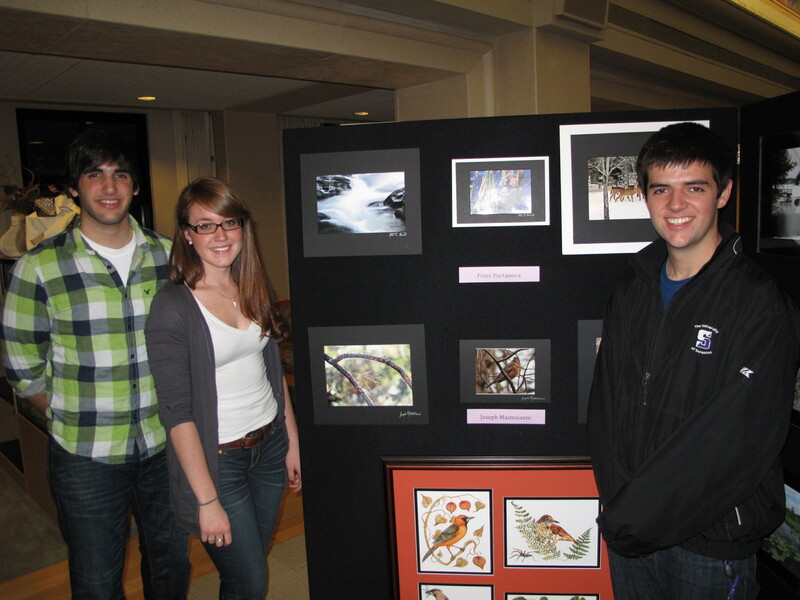 Click the following link for more pictures from the Reception for the Environmental Art Show. 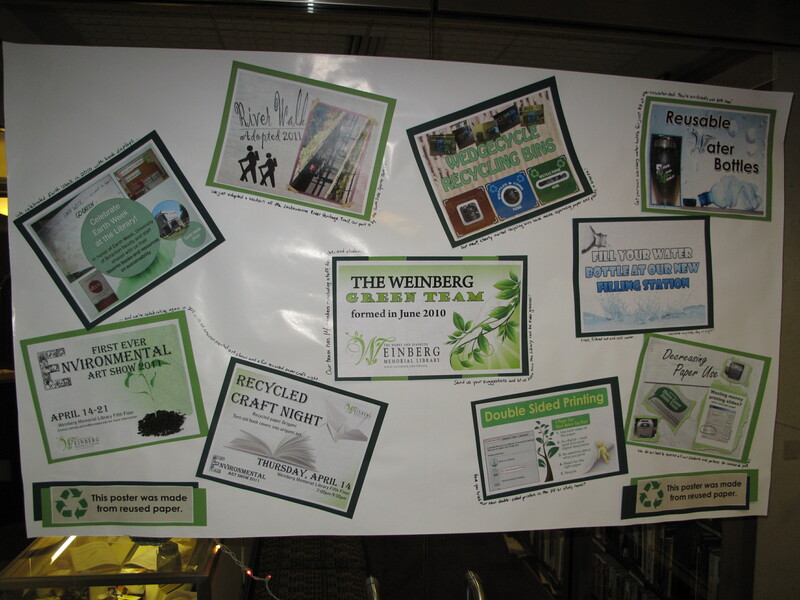 In this poster we displayed all of the library Green Team’s many accomplishments. Some of which include the selling of Reusable Water bottles at the same price it cost us to make them, the installation of a Water Bottle Filling Station, the installation of double-sided printers, tri-colored recycling bins, the adoption of a section of the LHVA’s Heritage trail, collaborating with the Communications department to make Sustainability PSAs which air on our TVs, and collaborating with students for their poster board session at the University’s Sustainability Fair. The Green Team knows it has a lot of work to do if we are going to to accomplish as much as we did in our first year, but we welcome the challenge! 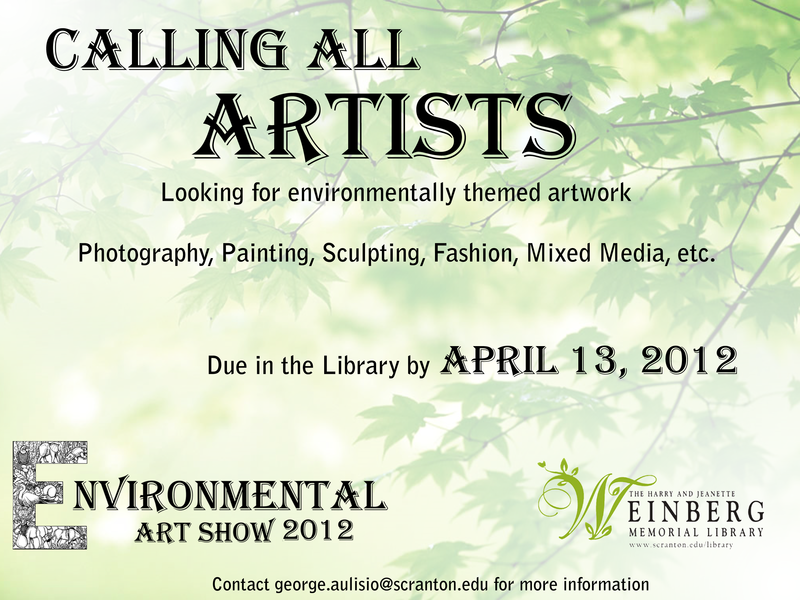 The deadline to submit your Environmental or Sustainability related art is quickly approaching! 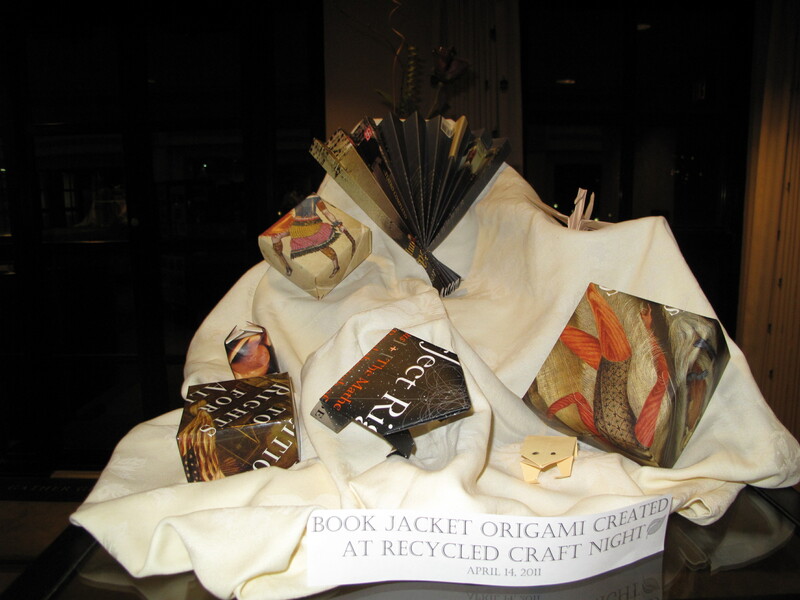 Please have your artwork delivered to the library (either the Circulation or the Reference Desk) before Monday April 11! 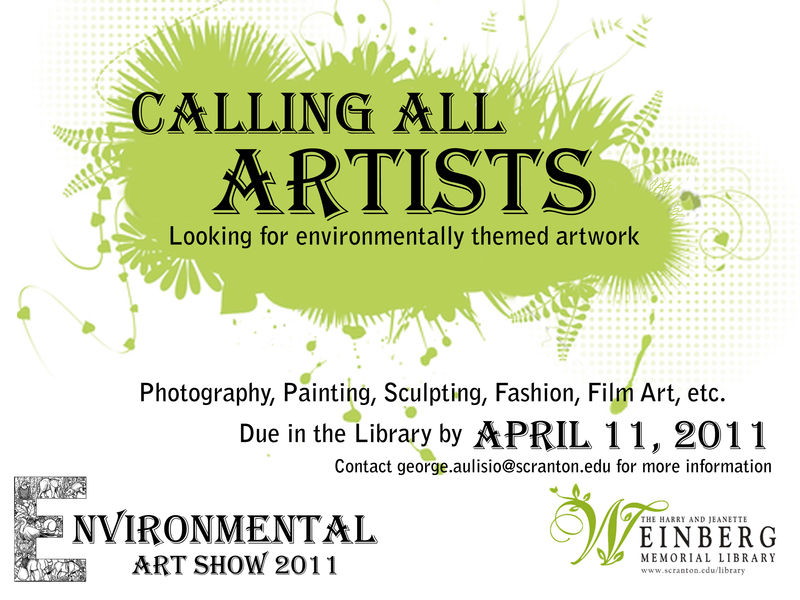 All types of artwork are invited to be submitted to the Environmental Art Show. The exhibit will run from April 14th to the 21st in the Heritage Room. On Monday April 18th at 7pm there will be a Grand Opening event for a chance to meet the Artists and discuss their work. Refreshments will be served.